Happy 10th Birthday Sensei's Library! The Ing timer is a go clock developed by the Ing foundation as part of their effort to promote the use of Ing rules around the world. The clocks are not easily available to the public, but are often provided as sponsorship for events that use Ing rules. Ing timers are infamous for their talking. Instead of using beeps or similar, the clock has a voice to count down the time in byoyomi, as well as to mention time and number of byoyomi period remaining. Black's position is full of bad aji at a, b, and c.
Aji means possibilities which are left in a position. Aji is a Japanese go term that has been adopted into English. One meaning of the ordinary Japanese word aji is taste, which lingers and it is this lingering feature that applies to what aji means in the context of Go. Those possibilities are latent and cannot be used immediately, but might come to life if the situation changes. That is why aji is also often translated as potential. There is an analogy which many people find apt. Aji is like a stone in your shoe when you are late. The stone hurts and you can't run as fast, but because you are late, you cannot stop to take it out. This is a list of computer programs that play go. 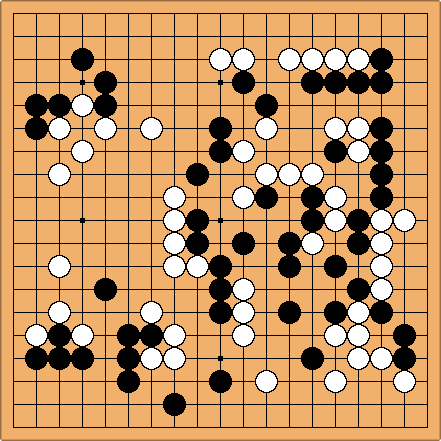 These are distinct from Go Clients, which allow a human to play go using a computer. For other types of programs and software that don't play, see Go Programs. A computer program playing online is called a Bot or Gobot. An extension is a big fuseki point that extends an existing configuration of one or more stones along the side, leaving several spaces between the played stone and the existing stones. It outlines potential territory towards the edge and/or blocks the opponent's extension (checking extension). Because moving along the side is so important, it is distinguished from moving toward the center, which is instead called a jump. If a stone is played directly next to an existing stone, it would be called a stretch or solid extension. Joseki heuristics are guidelines for playing corner patterns. They serve to determine if a corner pattern results in an equal result, or favorable to either of the players. 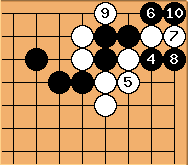 Well established corner patterns (joseki) are, or at least have been, considered to be equal. Deviating from them results in either unsettled, slightly favourable or clearly biased results. Who gets the corner territory? Are there any defects (aji) or lack thereof (thickness) in either position? Last but not least, who gets the initiative? The corner eye shape in this diagram is known as bent four in the corner. 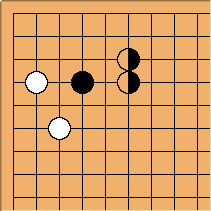 If Black has one or zero outside liberties, as in this diagram, then White can create a ko for the life of the black group by play at the marked point. This is a favorable ko for white, because black has to throw in at the 1-1 point to start the ko, allowing white to take first. More important than the status of this specific shape, however, is what happens if a player can almost fill a group with a bent four. In such cases, the player can leave the group until the end of the game before starting the ko. Since the attacker takes the ko first, this usually means that the group cannot be saved, and that the players need not even play the ko. This is the situation known as "bent four in the corner is dead". Because the group is not dead outright, but only through ko, the status of the group may depend on the rule set in use, and the possible availability of unremovable ko threats. It is a famous example of a situation that has posed a challenge to many rules writers. The Go Teaching Ladder is a site where you can have your games reviewed. Having your games reviewed is widely considered one of the best ways to get stronger, as the review will focus on the specific mistakes that you make. The ladder in the name refers to the fact that anyone can review, and have their games reviewed. If you send in your game, it will be reviewed by a player who is several stones stronger than you. In exchange, it is appreciated (but not mandatory!) if you are willing to review the game of a player who is several stones weaker. This way, we all help each other get a little stronger. Nakayama Noriyuki (中山 典之; born September 3, 1932; died February 16, 2010) was a professional 6 dan player affiliated with the Nihon Ki-in. He wrote over 30 go books, the most famous of which is The Treasure Chest Enigma, and also ghost wrote books for many top professionals. Nakayama visited the west often, where many players have fond memories of Nakayama's teaching and his friendly personality. In the article you will find a selection of anecdotes highlighting his personality and his relationship with go in the west. Although players from the West have not yet reached the level of the world's top players, that does not mean that there are no local heroes. Whether they are 3 kyu or 7 dan, each country has players that are regarded, within their own community, as the top of the bill. This page gives an overview of the top amateur players from all countries in the world where organized go is played. 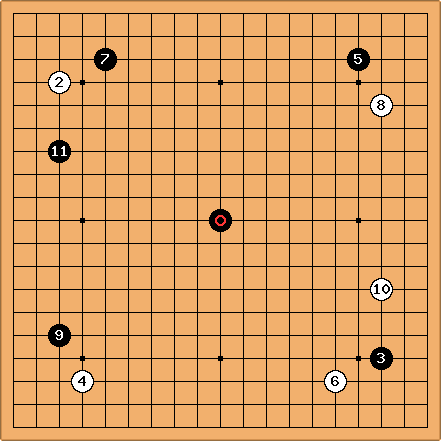 An enclosure, or shimari, is a position where one player has played twice in the same corner, without any moves there by his opponent. The purpose of an enclosure is generally to make territory, although high, influence oriented enclosures are also sometimes played. There are five standard enclosures that are played very often, and another seven or eight that are played regularly in professional games. 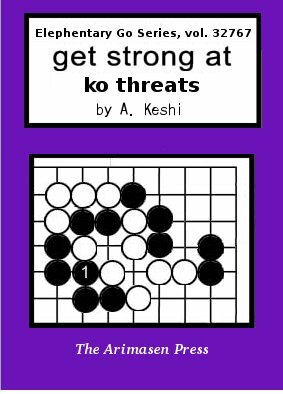 Each enclosure has different strengths and weaknesses, and there is a large body of study into enclosure joseki for dealing with them. This article gives a comprehensive overview of the commonly played enclosures, and the strategy that is involved. 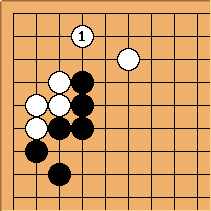 Wbaduk (World Baduk), formerly known as CyberOro, is one of the major Korean go servers. It is frequented mostly by Asian players, but is one of only two Korean servers that offers an English language Windows client. Wbaduk has several interesting features not found on English servers, such as the possibility to estimate the score during play and to edit the board during play to improve the score estimate. It is possible to negotiate to turn those features, as well as the possibility of undos, off for a game. The well known monkey jump is a move where a player makes a large knight's move jump from a second line stone onto the first line, usually as a big endgame reduction of opposing territory. The reverse monkey jump, as the name already indicates, involves the opposite move, jumping with a large knight's move from a first lin stone onto the second line. An example is given in the diagram, where is a reverse monkey jump from . When possible, the reverse monkey is generally even more devastating to the opponents territory than the normal monkey jump. The reverse monkey jump is much rarer, however, because it does not happen very often that a player already has a stone on the first line from which the jump can be made. It is most often seen in situation where a first line move is sente on one side, while also enabling the reverse monkey jump on another side. 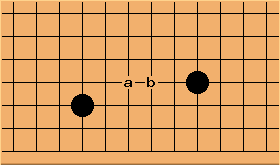 in the diagram is an example of the tesuji known as a keima watari (knight's move connect under). 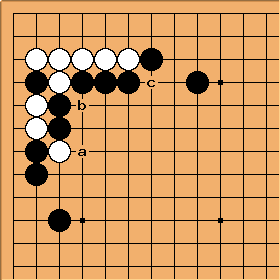 After this move, all the white stones are connected, there is nothing black can do to split them, although there are several lines of play where white must be careful. The keima watari is often a good dual purpose move, which both ensures a connection and makes some territory along the edge in the progress. This tesuji is always on the second line, connecting with a boomerang shape. Get Strong at Go Parodies is a set of parodies on the popular Get Strong at Go book series by Richard Bozulich. The parodies were started by Rex Burton under the name Ritchie Press, and were quickly followed by others. Below is a sample of the parodies. The two-stone corner squeeze is a technique used in capturing races in the corner. It is a corner variation of the two-stone edge squeeze. Josekipedia ( http://www.josekipedia.com/) is an open and community contributed joseki database. It is created by Adam Miller, the creator of the popular goproblems.com website. This website contains several novel ideas for a joseki database, such as colour coding and voting on moves. It includes trick moves and wrong lines as well. This website is still quite new and contains only a limited number of josekis. As of 12 April 2010, the database contains slightly more than 12,000 different sequences. The endgame is an important phase of the game. Once all groups are settled, the focus of the game moves toward maximizing your points. Playing endgame well is difficult, and weaker players often feel pushed around by stronger players in this phase. Here, we give a basic overview of what the endgame is about, including theory on sente and gote, on ways of evaluating moves, and on determining the correct order of play. Mirror go refers to the practice of mirroring the opponent's moves in a point reflection on tengen. It can be played by either black or white, though black needs to open on tengen to use it. 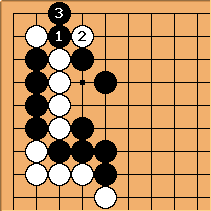 The diagram below gives one of the more famous examples of mirror go, from the First game between Go Seigen and Kitani Minoru. Read this article to find out how mirror go is used, and how it is countered. David B. Benson, in his article Life in the Game of Go, defined an algorithm for checking whether a stone, or group of stones, is pass-alive. That is to say, the group is alive even if the owner of the group keeps passing. No matter what an attacker tries, the group cannot die in any way. This algorithm is very useful in Computer Go programming, as it provides a basis for finding more life and death status in more general cases. 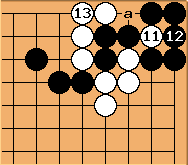 The vocabulary of go players in the west is replete with terms borrowed from Japanese. Even the name of the game itself stems from the Japanese language. From the simple ko or hane, to the complicated me ari me nashi or ishi no shita, you will encounter these terms in conversation. 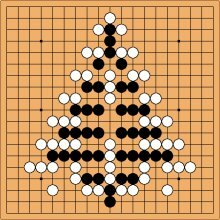 This article gives a complete overview of all Japanese go terms and their meaning, with links to the appropriate articles where available. Basilisk Go Server is a web-based correspondence Go server whose main goal is to support variant rulesets. Currently, the server allows you to play other topologies, such as toroidal go (no edges) or klein bottle configurations. You can also play Heisengo, which introduces an element of uncertainty into the game, such as having a small chance to get two moves in a row. A ko threat is a move with a "big" follow-up, which you play after your opponent has captured a ko; if your opponent answers it you may recapture the ko. (You cannot recapture the ko immediately, due to the basic rule of ko.) If your opponent does not answer your ko threat, but instead proceeds to resolve the ko, you can follow through on your threat and thus gain compensation for losing the ko. Here is a simplified example of a ko threat. takes the ko. White cannot retake the ko immediately, so she plays a ko threat, the atari at . If Black responds, by saving his three stones with , White can now retake the ko at . A notcher is a surrounded group of stones on the side, consisting of stones on the third line, flanked by stones on the second line. Notchers are frequently encountered in life and death situations at the side of the board. On Sensei's Library, we study one-space notchers, two-space notchers, and three-space notchers. For systematic study, there is also a table of notchers, showing the critical notchers. In the mixed four space extension, is it better to invade at a or b? The page mixed four space extension, invasion tells you more about these invasions. The Atomic Bomb Game was a game played 4-6 August 1945 in Hiroshima City when the atomic bomb "Little Boy" exploded over Hiroshima on the third day of the game. The game was the second game of the third title series for the Honinbo title, with Hashimoto Utaro being the title holder and Iwamoto Kaoru being the challenger. The big bulge is the shape formed by three stones with a keima-keima-ogeima relationship, as shown here. It's a good shape because it's flexible, but also very well connected. However, it has a weakness when it comes to eyeshape. This term is coined in Charles Matthews' book Shape Up. This shape is also known as boomerang shape. When you are in a winning position, a way to seal the game is to force your opponent to start a ko that he cannot win. Usually the ko is such that you make a significant gain while your opponent has no ko threat of at least the size of your gain. As such, winning the ko settles the position and can simplifies the game considerably, leading to a clear advantage. Tedomari means the last play. It is used not only for the last play of the game, but for the last play at different stages, and for the last play before the size of plays (temperature) makes a significant drop. As a general rule you want to try to get tedomari. There is a saying about the last gainful play of the game, tedomari is worth double. Getting tedomari is related to go infinitesimals and how to play them. Cho Chikun (Japanese: 趙 治勲 Chō Chikun, Korean: 조치훈, 趙 治勲, RR: Jo Chi-hun, MC-R: Cho Ch'i-hun, born June 20, 1956) is a professional go player. Cho was born in Seoul, South Korea in 1956. His uncle Cho Nam-ch'eol was one of the leaders of professional Go in South Korea in the post-war period. He was brought to Japan at the age of 6 by his older brother Cho Shoen (who was himself a young professional Go player in Japan) to become a student at the Kitani dojo. He qualified as a professional shodan at the age of 11, the youngest person to ever do so in Japan. The throwing star shape is formed by four knight's moves. It is a strong shape, much like a ponnuki, and is also flexible. Since it takes four moves in a limited area to build, it is also quite slow, however. This page is intended to collect a couple of endgame tesujis that are easily overlooked. While some of these moves may be missed by dan-level players, they can be understood even by kyu players. A framework, or moyo, is an area where one player has a large influence, and which potentially could become that player's territory. In the diagram we see a large black framework on the lower left side, and a white framework on the right side. This shape is an empty triangle, empty referring to the unoccupied point at . Typically, the empty triangle is bad, being inefficient and prone to shortage of liberties. Empty triangle is also sometimes called the devil's shape (onigatachi), because it brings to mind the long nose of one kind of Japanese demon. Fujisawa Hideyuki (藤沢 秀行, 1925 June 19 - 2009 May 8), commonly called Fujisawa Shuko (藤沢 秀行 Fujisawa Shūkō), was one of the best players during his era. He won the first edition of many titles, among others the first Meijin (1962), the first Tengen (1976), and the first Kisei (1977). Thought to play the strongest fuseki among contemporaries, he was infamous for making a blunder in a winning position. Fujisawa Hideyuki is also held in high regard for his contribution to Chinese Go by the way of regular study trips to China beginning in the 1980s. His son Fujisawa Kazunari and his granddaughter of Fujisawa Rina are active professional players. Half-point ko is the name given to a ko that is only about a single stone, as in the example diagram. The name derives from the fact that Black needs two moves to make one point here, one move to capture and one to connect, meaning that even though Black can gain a point, it is better to play moves that gain a point with only one move. 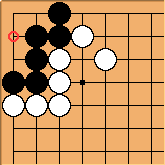 In fact, when using miai values for moves, the half-point ko is only worth one third of a point. For these reasons, half-point ko's are usually the last things to be played in the end game, though eve then they can be decisive for the game's outcome, especially on the highest levels, where the margin between victory and defeat is often razor thin. A long expected Sensei's Library feature has finally arrived! The Find Position Page allows you to search all the diagrams on sensei's library for certain positions. The search includes wildcards, allows any shape for the searched area, and will give counts for common continuations from the searched position. The position search can also be accessed from any diagram through the binocular icon under it. 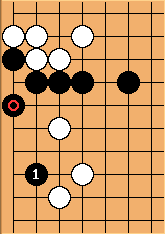 The diagram to the left shows an example, finding all positions where white has played a slide under a black 4-4 stone, with wildcards to allow for either a high or a low extension. Go ahead, try it out by clicking the binocular! Igolocal.net is a physical Go server and scheduling service for all those people who learned Go online, but never actually met another Go player in real life or placed a stone on a physical board made from wood. Started on 30 July 2010 it is continuously growing with already some 1700 players from over 70 countries. 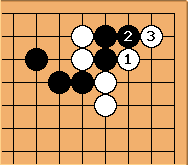 is the driving tesuji, giving Black two sente moves at and , pushing through the small gap, hurting the marked stone. The World Youth Goe Championship (WYGC) is an annual international tournament for youths. This is a Goe event, sponsored by the Ing Foundation, and therefore Ing's rules are used. A number of strong participants in the World Youth Goe Championship eventually became professional players. The World Amateur Go Championship (WAGC) is an event in which amateur players from around the world compete for the official world amateur title. The event is held every year, under the supervision of the International Go Federation. In 2003, the WAGC was canceled due to the SARS outbreak, and Korea hosted a replacement event, the Incheon World Amateur Baduk Championship (IWABC). Ten years ago Sensei's Library was born. It all started with the first pages being created on October 21, 2000, and a few months later Sensei's Library was ready to go public on January 04, 2001. Sure, it looked different back then, but the endeavour to turn it into the proverbial pot of Go(ld) has remained the same. While the end of the rainbow is still far ahead, Sensei's Library has evolved into a treasure trove filled with knowledge and toys with more than 20,000 pages. Happy 10th Birthday Sensei's Library, and congratulations to all those who made this happen! Sakata Eio (坂田 栄男, a.k.a. Sakata Eiju;, February 15, 1920 - October 21, 2010) was a 9 dan Japanese professional player who collected a record number of 64 big titles from 1950 to 1975. His teacher was Masubuchi Tatsuko. Among Japanese professionals, only Cho Chikun has won more title matches, 71 titles as of 2007. Sakata is called the "Inventor of Myoshu" in the book Go on Go. He authored many books in Japanese. His Sakata no Go series, aimed at dan players, is still in print after more than forty years, a modern classic. Amongst his books translated into English are Modern Joseki and Fuseki, The Middle Game of Go, Tesuji and Anti-Suji of Go and Killer of Go. 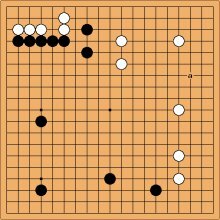 What is the worst possible move that you can play for a particular position? What seems to be a rather ridiculous question to begin with was turned into a small but enchanting set of problems by char. These problems force you to think about the status of the group in quite a new way. Sure you can find a bad move, but do you know the worst? 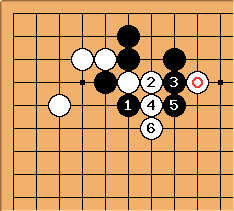 In this example, and is the sacrifice known as the two-stone edge squeeze, allowing black to win the capturing race. One of the fast ways to improve your go is to improve your basic instincts. These instincts allow you to much more quickly assess and respond to move by your opponent. The basic instinct move is the simplest and best way to respond to a move in almost any situation. Although there are exceptions, you can rarely go wrong by following your instincts, and they will come in especially handy in situation where you are short on time. This page gives you a set of basic instincts that any player should know, and should try to follow. Ladders are one of the basic capturing techniques. While you learn what ladders are fairly early, a lot of amateur player does not bother to read them out - at least before it is too late. That is a pity, because reading ladders is a good way for beginners and more advanced players alike to train their reading muscle. Ladders are long and unbranched, so it forces you to visualise the whole thing. When you can read a ladder over the whole board and then back again, you will feel the difference. If you feel too strong for that, how about adding some of your own nice ladder problems to Sensei's Library? After suffering badly from downtime and a server crash in the last weeks the Online-Go Server (OGS) is back online. It is a turn based / correspondence Go server that started five years ago in November 2005. OGS has a heavy focus on organised tournament and competitive play, with a fully integrated game reviewing system to help players improve their ability. On OGS there are some features that are unique to Go servers such as conditional moves (the ability to set up pre-programmed responses to your opponent's moves, thus speeding up the flow of the game) and on-site game reviews. to all readers of Sensei's Library!